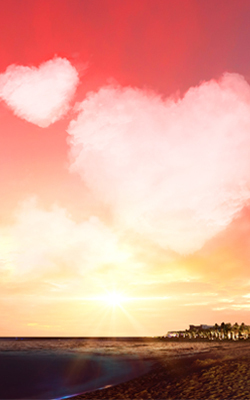 Valentine’s Day is nearly here and love is in the air! If you’re bored of staying in Dubai and time-strapped to fly overseas for Valentine’s day, we have the perfect compromise for you. 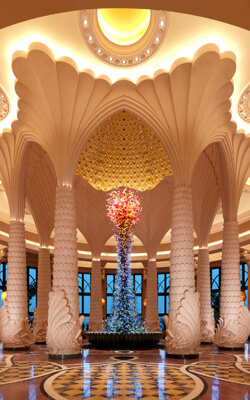 When it comes to popping the question on Valentine’s Day, surprising your sweetheart with a romantic weekend break, or celebrating an anniversary and enjoying romantic moments together, nothing compares to our Atlantis Dubai’s Valentine’s Staycation Offer that’s crafted specially for you and your special one to experience the true meaning of romance in a luxurious getaway. A late check-out on request to keep the Valentine’s spirit going. For moments you’ll never forget, discover the charm and elegance of our gorgeous hotel rooms and suites that will accommodate all your preferences and needs. Wake up to the smell of crisp ocean air and enjoy the sound of waves crashing against the seashore all while relaxing and basking in each other’s love from the comfort and privacy of your ocean view Guest Rooms. Feel like royalty in our Imperial Club Rooms, with exclusive all-day access to the brand new Imperial Club Lounge, a range of complimentary services and amenities and so much more. Experience an ideal retreat in the romantic setting of our Club Suites that offer premium suites privileges throughout your stay. Regardless of the occasion, you are sure to find the perfect place to stay at the end of your perfect day at Atlantis, The Palm. Indulge in the ShuiQi Couple’s Treatment; a 75-minute treatment including a full body scrub and full body massage in one of our Couples’ Suites. For lovebirds wanting to take their pampering session to the next level, we recommend the Shiseido Japanese Couple’s Ritual. In the privacy of ShuiQi’s ‘Royal Spa Suite’, this exclusive treatment begins with an infused rose petal foot bath and a Japanese inspired body bath. The ritual continues with a full body Qi massage, scalp massage and Shiseido’s premium facial, ‘Future Solution LX Facial’ for her, and the ‘Time Fighting Facial’ for him. A selection of elegant sushi and soothing Japanese green tea is served at the end of the ritual. **This offer is valid throughout the month of February 2019. As a culinary destination, Atlantis, The Palm offers you for the perfect romantic dinner date. Be it for a casual night out or to celebrate Valentine’s Day with the love of your life, you are sure to find the most romantic dining experiences in Dubai. 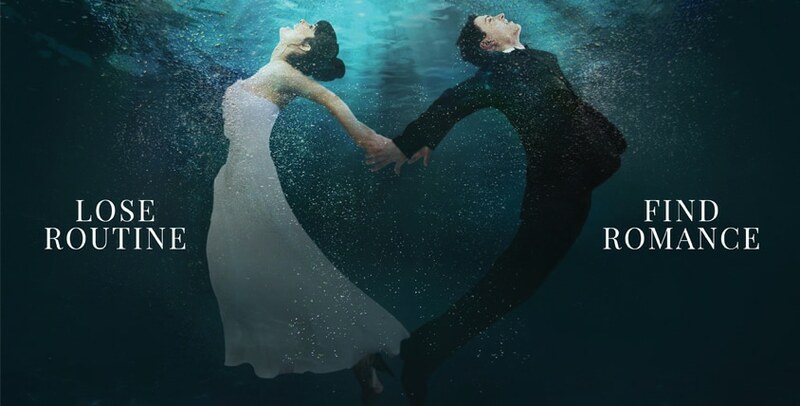 With special menus on February 14, take your loved one to Ossiano, the most romantic underwater restaurant in Dubai, for a flavourful fine dining experience with mesmerizing view of the Atlantis’ underwater world that will blow you away. Want to make it extra special? 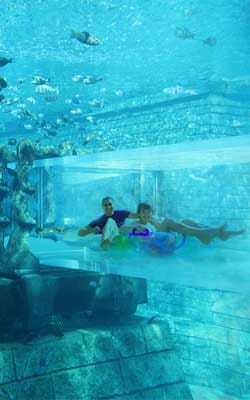 Allow our guest services team to organise a personalised message delivered by our divers in The Ambassador Lagoon. *The dining experiences & the above mentioned couple treatments are not a part of the Valentine’s Stay Package. 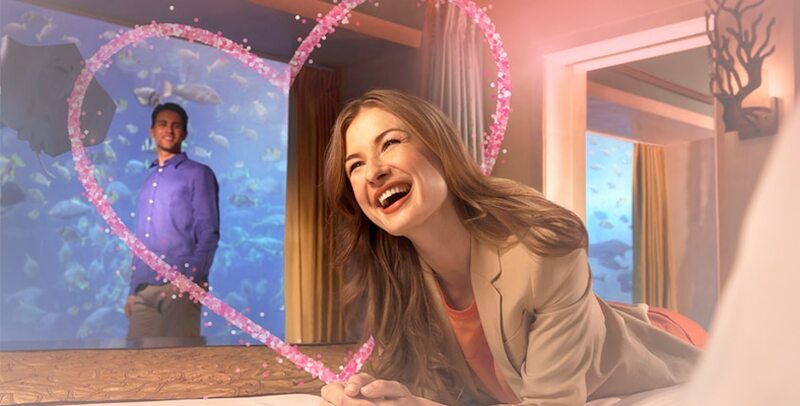 Amaze your Valentine with a special dive in The Ambassador Lagoon as you swim alongside sharks, rays and hundreds of colourful schooling fish with the keeper of your heart. 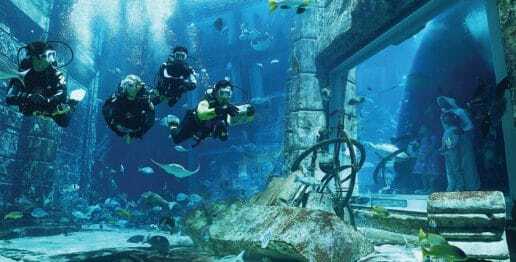 Start your love affair with diving right here by choosing from a range of diving experiences at The Lost Chambers Aquarium that are open to everyone, from the world’s most popular and widely recognized PADI dives to the thrilling Atlantis Aquarium dives in the Ambassador Lagoon. There is an abundance of choices you can indulge in at the Marine and Waterpark attractions during your staycation at Atlantis. So what are you waiting for? Book your romantic staycation today and enjoy a very special Valentine’s day at Atlantis, The Palm!